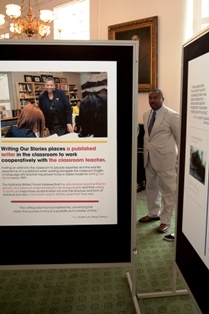 The Alabama Writers’ Forum and the Alabama Department of Youth Services (DYS) held a public viewing of its exhibit depicting the award-winning Writing Our Stories program on May 10. The event was held in the Old Supreme Court Library in the Alabama State Capitol. According to Jeanie Thompson, executive director of the Forum and founder of Writing Our Stories, the exhibit coincided with Child Abuse and Neglect Prevention Month in April and will continue through May 31. The exhibit is comprised of thirty-four panels, with quotes from students, teachers, and writers and poems and graphics that were published in several anthologies. Writing Our Stories takes place through a cooperative arrangement between the Alabama Writers' Forum and the Alabama Department of Youth Services. 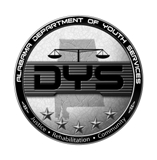 Funding for the project, which includes nine months of instruction, as well as in-service training and anthology editing, is provided by a DYS grant with additional support from the Alabama State Council on the Arts and the National Endowment for the Arts. Sena Jeter Naslund received a Governor’s Arts Award at the Celebration of the Arts ceremony on May 17 at the Alabama Shakespeare Festival. 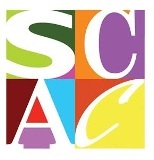 The event was sponsored by the Alabama State Council on the Arts (ASCA). Naslund is the author of six novels: Adam & Eve (William Morrow-HarperCollins, 2010); Abundance: A Novel of Marie Antoinette (William Morrow-HarperCollins, 2006); Four Spirits (William Morrow-HarperCollins, 2003; Harper Perennial, 2004); Ahab’s Wife; or, the Star-Gazer (William Morrow, 1999; Harper Perennial, 2000; Harper Perennial Modern Classics Series, 2008); Sherlock in Love (David R. Godine, 1993; Harper Perennial, 2001); and The Animal Way to Love (Ampersand Press, 1993). She has also published two short story collections, The Disobedience of Water (David R. Godine, 1999; Harper Perennial, 2000) and Ice Skating at the North Pole (Ampersand Press, 1989). She has received grants from the National Endowment for the Arts, the Kentucky Arts Council, and the Kentucky Foundation for Women. She is also the recipient of the 2001 Harper Lee Award for Alabama’s Distinguished Writer of the Year, the Alabama Author Award, the Lawrence Fiction Prize, the Heasley Prize, and the Hall-Waters Award. She has served as the Paschal P. Vacca Professor in Liberal Arts at the University of Montevallo, Visiting Eminent Scholar at the University of Alabama in Huntsville, Writer in Residence at Wolff College in Fairhope, and Kentucky Poet Laureate. Other recipients included Dale Kennington, Henry Panion, and Joyce Cauthen. ASCA also presented The Jonnie Dee Riley Little Lifetime Achievement Award to Joe McInnes, The Alabama Distinguished Artist Award to Rebecca Luker, The Alabama Folk Heritage Award to James Bryan, and The Special Council Award to former First Lady Patsy Riley. The Alabama Writers’ Forum is pleased to announce that Youssef Biaz from Auburn High School placed first in the nation on April 29 in the Poetry Out Loud: National Recitation Contest in Washington, D.C. He delivered his final poem, “Filling Station” by Elizabeth Bishop, which solicited audience response for every line. This poem took him to first place. For this honor he received a scholarship award, and his school library received a $500 stipend for the purchase of poetry books. Biaz was accompanied in Washington by his teacher, Davis Thompson, his parents and sisters, and Donna Russell from the Alabama Alliance for Arts Education. Biaz recited his award-winning poem for President Obama and the First Family at the An Evening of Poetry at the White House on May 11. The 2010-2011 Letters About Literature Alabama winners were announced at the Alabama Book Festival, held in Montgomery in April. Young readers from across the state were invited to participate in Letters About Literature, a national reading and writing contest asking students to write a personal letter to an author explaining how that author’s work somehow changed the readers’ view of their world. The national competition is sponsored by the Center for Book in the Library of Congress in partnership with Target. The state level competition is also sponsored by the Alabama Center for the Book, located at the University of Alabama Libraries. Judges from the Alabama Center for the Book selected the top letters in the state on each of the three levels of competition: Level 1 for students in grades 4–6; Level 2 for students in grades 7–8; and Level 3 for grades 9–12. The Alabama State Poetry Society (ASPS) recently announced the recipients of its Poet of the Year and Book of the Year awards. John Chambers of Huntsville received Poet of the Year honors and Barry Marks of Birmingham won Book of the Year for Possible Crocodiles. Chambers served for seventeen years as the music critic for The Huntsville Times. After retiring, he founded and edited the literary journal Elk River Review. His poetry, articles, and reviews have been published in numerous journals, anthologies, and magazines. His books include Camellias in Autumn and A Taste of Wine and Gentian. He co-edited Whatever Remembers Us: An Anthology of Alabama Poetry with Alabama Poet Laureate and Alabama Writers’ Forum board president Sue Brannan Walker. His most recent book is Steve’s Story: A Memoir. In 1987, he received the Distinguished Alumnus Award from Athens State University. Possible Crocodiles was published in 2010 by Brick Road Press of Columbus, Georgia. A Birmingham attorney, Marks’ poetry, fiction, articles, and essays have appeared in nearly 100 journals, magazines, and periodicals over the last thirty years. Marks was 1998 ASPS Poet of the Year and his chapbook, There is Nothing Oppressive as a Good Man, won the Society’s 2003 Morris Chapbook Competition. A member of the Big Table Poets, his work is featured in that group’s anthologies Poems from the Big Table and Einstein at the Odeon Cafe. He is a past president of ASPS and a former Board member of Alabama Writers’ Conclave. ASPS is accepting submissions for the Annual John and Miriam Morris Memorial Chapbook Competition. Winner receives $100 and 50 copies of his/her winning chapbook. Deadline is May 31. The organization also seeks sponsors for its Fall Contest brochure. Auburn University and the Auburn Writers Conference (AWC) invite writers to participate in “Myth, Memory, and the Haunted Muse” to be held on October 7-8 in Auburn. This year’s theme, “Myth, Memory, and the Haunted Muse,” asks participants to consider the ways that writers use the idea of "the haunted" in their work—either literally or figuratively, as in the memories, histories, people, and places that haunt, and hence propel, characters. Conference attendees are invited to read their short fiction, creative nonfiction, and/or poetry. To be considered for a reading slot, please submit a 300-500 word excerpt of creative writing appropriate for a fifteen-minute presentation. Deadline is June 1. Offering instruction, practice, perspective, and community in a relaxed setting, AWC features small-group workshops, panel discussions, and readings from emerging and established authors. The 2011 conference will feature three New York Times bestselling authors: keynote speaker Joshilyn Jackson (Gods in Alabama, Backseat Saints), Arts and Humanities Distinguished Speaker Mark Kurlansky (What?, Edible Stories, The World Without Fish), and Rachel Hawkins (Hex Hall, Demonglass). Seventeen students from Birmingham area high schools participated in the 2011 WORD UP! Student Poetry Slam sponsored by the Birmingham Public Library (BPL) in April. Taking inspiration from the poem “Daybreak in Alabama” by Langston Hughes, these young poets presented original work on themes ranging from composing new songs for Alabama to the reflections on the inner-musings of a poet. Students were rated on content, vocal presentation, movement, and overall performance. Winners included Derrick Spencer of Ramsay High School (first place), Illyshia Parker of Woodlawn High School (second place), and Tamunotonte Korubo of Shades Valley High School (third place). Judges for the event were Jerri Hardesty, Barry Marks, and Priscilla Hancock Cooper. Jim Reed of Reed Books in Birmingham was the emcee for the event. WORD UP! has evolved into a year-round creative writing project with the library hosting monthly poetry workshops led by John Paul Taylor, executive director of Real Life Poets. The workshops meet on the first Saturday of each month from 2-4 p.m. at the Birmingham Public Library, They are free and open to middle and high school students. Nominated Alabamians include Leaving Gees Bend by Irene Latham (Putnam), Don't Quit Your Day Job by Sonny Brewer (MP Publishing), and Crooked Letter, Crooked Letter by Tom Franklin (William Morrow). Wayne Greenhaw was recently a SIBA Okra Pick for his book Fighting the Devil in Dixie: How Civil Rights Activists Took on the Ku Klux Klan in Alabama (Lawrence Hill Books). Twenty-four titles were chosen by bookseller vote out of a nominee list of over 100 books, in the categories of Children’s, Young Adult, Poetry, Nonfiction, Fiction, and Cooking. Finalists will be judged by a jury of SIBA booksellers and announced in July. Auburn University English faculty member Peter Campion recently received a John Simon Guggenheim Memorial Foundation Fellowship. The recent Fellowships represent a diverse group of scholars, artists, and scientists. Appointed on the basis of prior achievement and exceptional promise, the successful candidates were chosen from a group of almost 3,000 applicants. Campion is the author of two books of poems, Other People (2005) and The Lions (2009), both published by The University of Chicago Press. In 2004 he published a monograph on the painter Mitchell Johnson, with Terrence Rogers Fine Art in Santa Monica, California. Past awards include an Academy of American Poets Award, a Wallace Stegner Fellowship and Jones Lectureship at Stanford University, a Pushcart Prize, the Larry Levis Reading Prize, and the Joseph Brodsky Rome Prize from the American Academy of Arts and Letters. He edits the journal Literary Imagination, published by Oxford University Press. The Alabama Humanities Foundation is still accepting applications for the ninth-annual Jenice Riley Memorial Scholarship benefiting kindergarten through sixth-grade teachers. This scholarship is a professional development opportunity for teachers to receive a $1,000 scholarship to enhance their teaching about Alabama/American History and citizenship and to encourage civic involvement by students in their community. The application deadline is June 17, 2011. The scholarship is named for the late daughter of Bob and Patsy Riley as a means of honoring her memory and her dedication to the teaching and nurturing of Alabama’s most important citizens: our young children. The scholarship may be used for any purpose to advance the recipient’s knowledge and teaching skills. Scholarships may be used for attending an institute or seminar; traveling to libraries, museums or archives; offering an innovative school program; or providing new educational opportunities for students. A little realism by Sonny Brewer, a little surrealism by Barry Hannah, and a little post-modernism by Jeffrey Sides and Jake Berry—all featured in the February Book Reviews. Each month First Draft Reviews Online features reviews of books by Alabama authors, books about our state, and books by local publishers. Each review offers a link to authors, publishers, and reviewers when available. The page also features a searchable archive to benefit readers, students, and scholars. June 25, 5-8 pm, Book Launch: Carolyn Haines, Turning Pages Book Store, Natchez, Miss. Each week on the Alabama Arts Radio Series, staff members of the Alabama State Council on the Arts visit with writers, musicians, visual artists, and other individuals who contribute to our state’s rich artistic traditions. Recent literary interviews include Sonia Sanchez, Priscilla Hancock Cooper, and Rick Bragg. Did you know that proceeds from the sale of the Alabama Support the Arts license plate help fund the Alabama Writers’ Forum? They do. Next time your car tag needs renewal, purchase one of these colorful plates to help support the Forum and other Alabama arts education projects. For late-breaking news, follow us on Twitter @ writtersforum and Facebook @ Alabama Writers’ Forum Friends.